It’s not just you: CAPTCHAs have gotten more difficult in recent years, thanks to artificial intelligence progressing to the point that machines can bypass older CAPTCHA versions. Software can still beat modern iterations to some extent, but Google’s reCAPTCHA(s goog) has done a decent job of remaining unbreakable. Not anymore. Vicarious, an artificial intelligence startup, announced today that it has developed software that can crack any type of CAPTCHA with at least 90 percent accuracy. Its secret is an advancement in crunching CAPTCHAs where letters are squished together and overlapped, which is what makes reCAPTCHA so effective. 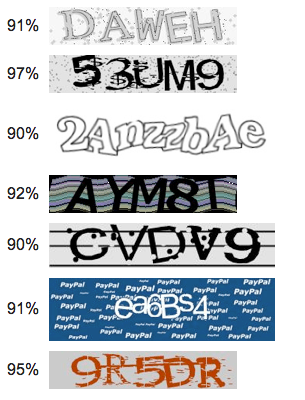 Earlier versions of CAPTCHA had evenly spaced letters that computers could easily pick out and process. When the letters are crunched together, it takes much more advanced software to pick out the distinct shapes. Google announced Friday that it updated reCAPTCHA to be simpler for humans while still challenging bots. The new version relies on numbers instead of letters, which humans find easier to pick apart. Google emphasized that a CAPTCHA on its own isn’t meant to sort out which users are human or a computer, but instead it is a combination of factors. Product manager Vinay Shet wrote in the blog post that how a user interacts with a page before and after entering a CAPTCHA is also considered, and suspected bots are issued different CAPTCHAs than obvious humans. Vicarious does not plan to release its software to the public, which means CAPTCHAs could be safe for now from advanced AI attacks. The company plans to eventually apply its artificial intelligence developments to image and video analysis and robotics.